Half of Students Cannot Identify the Atoms in Water — Scary! It frightened us to learn that nearly half of eighth graders all across the country cannot correctly identify the atoms in a water molecule. How can we expect today’s youth to care about the quality of water they ingest through out their lives if they can’t even figure out what atoms make up water in the first place?!? Barely half of New York state’s public school eighth graders were able to correctly identify the atoms in a molecule of water on national science exams last year, test officials said this morning. Just 54 percent of students here picked the correct combination — 2 atoms of hydrogen and 1 of oxygen — out of four options given for a multiple-choice question on the 2011 National Assessment of Educational Progress. If you have a young child PLEASE take the time to teach them about basic topics like what elements make up the chemical equation for water: H2O. Two hydrogen molecules and a single oxygen molecule. Despite the fact that half the students could not answer such a simple question about water, some students out there know a LOT about water because they have worked with test kits like the Science Project Kit manufactured by WaterSafe. 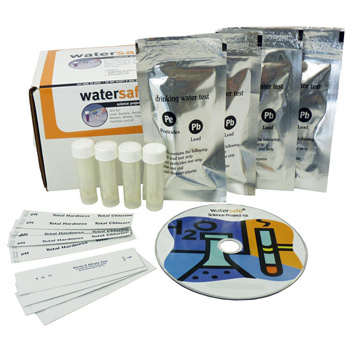 The WaterSafe Science Project Kit gives young scientists the ability to test different samples of waters, or the same sample at different times, for critical water quality parameter and compare the results to each other and to established or expected values. Included in the test kit students will find tests for the following water contaminants and parameters: Lead, Bacteria, Pesticides, Nitrates, Nitrites, Chlorine, Hardness and pH.